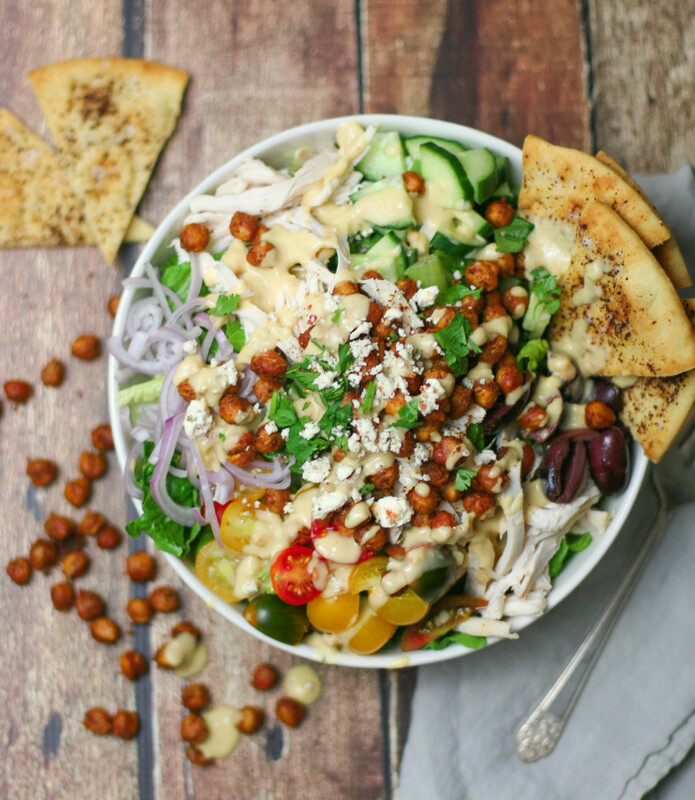 Have you tried crispy chickpeas yet? Basically, you rinse and drain a can of chickpeas, dry well, drizzle with olive oil, and season liberally with the dried spices of your choosing. (Smoked paprika is pretty clutch). But, while perusing Pinterest this week, I stumbled upon this delicious looking kale salad with tandoori spiced chickpeas from Minimalist Baker. Ding Ding Ding! Lightbulb going off! 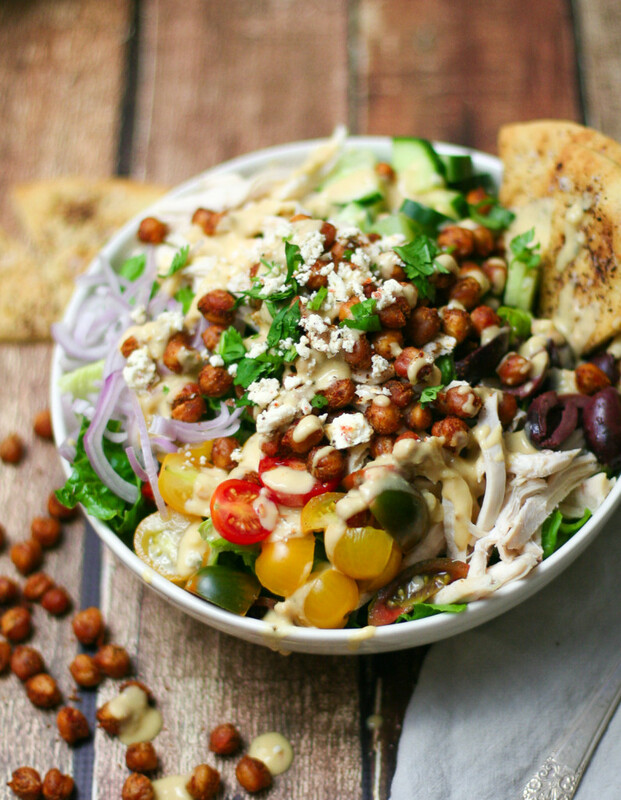 OF COURSE crispy chickpeas would be fabulous in salads. They can act like suped-up croutons with tons of flavor, fiber, and nutrients. So, off to the salad drawing-board to brainstorm crispy chickpea applications. This recipe is a labor of love. 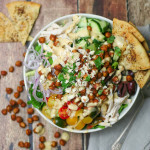 There are a lot of moving parts (poaching/shredding chicken, roasting chickpeas, making homemade pita chips, making dressing, and prepping veggie), but the end results are AWESOME! 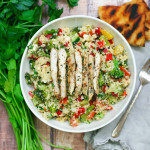 It’s perfect for leisurely weekend meal or when you have friends over. Make all the components and have everyone build their own bowl. Easy peasy. Bring a pot of water to a rolling boil. Add the chicken breasts, reduce the heat to a simmer, and cook until the chicken is no longer pink and has reached an internal temperature of 165 degrees Fahrenheit, about 15-20 minutes (exact time will vary based on the size of your chicken breasts). 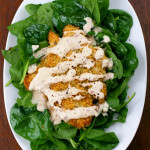 When the chicken is done, remove to a plate, let cool, and shred into bite-sized pieces. Preheat the oven to 375 degrees fahrenheit. Lay paper towels on a large rimmed baking sheet and dump the rinsed and drained chickpeas on top. Cover with another layer of paper towels and lightly press and roll the chickpeas around under the paper towels to completely dry them. Discard the paper towels and spread the chickpeas out on the baking sheet. Drizzle the chickpeas with 2 tablespoons olive oil, and sprinkle with the seasonings (cumin, smoked paprika, salt, pepper, garlic powder, and coriander). Use your hands to toss to coat, and spread the chickpeas over the baking sheet. When the oven is preheated, place the chickpeas in the oven and cook for 45 minutes to 1 hour, until golden and starting to crisp. Remove from the oven and let cool on the baking sheet. They will continue to crisp as they cool. Leave the oven on, and prep the pita chips. Lay the pita triangles out on a baking sheet, brush each one with olive oil, and sprinkle with the kosher salt, garlic powder, and sumac. Place in the oven and bake for 8-12 minutes (time will vary based on the thickness of your pita chip) until golden. Remove from the oven and let cool. Like the chickpeas, they will continue to crisp as they cool. Finally, make the hummus dressing. Place the hummus, lemon juice, garlic, and olive oil in a bowl. Whisk to combine. 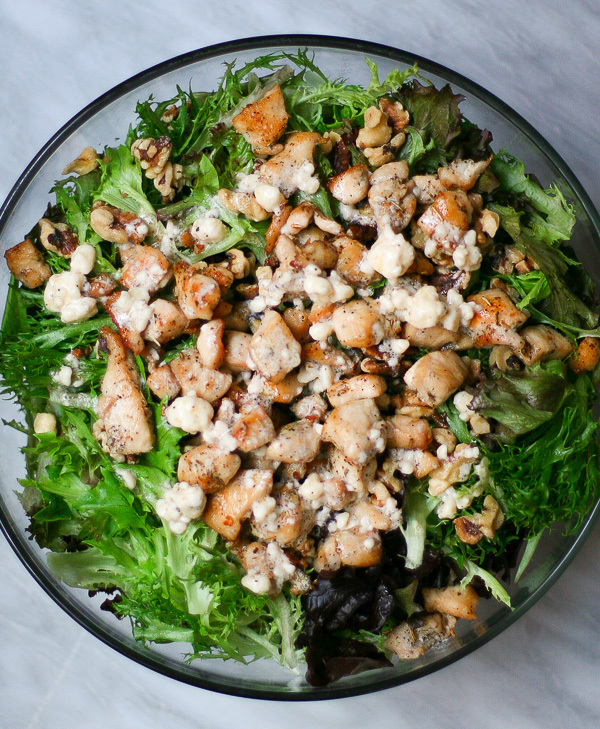 Add a splash of water to thin to a salad dressing consistency. 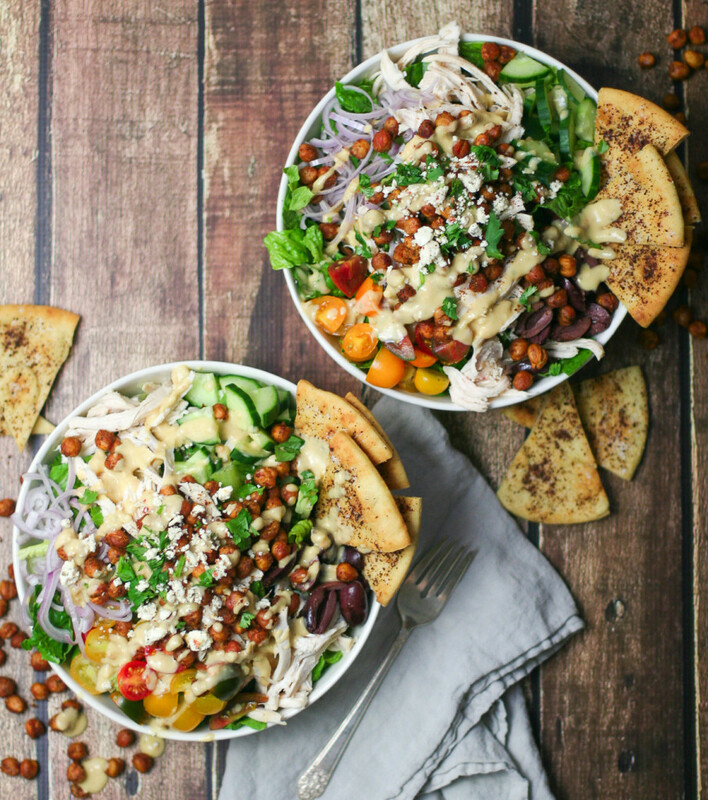 To serve, fill 4 large bowls with lettuce, top with shredded chicken, tomatoes, cucumber, roasted chickpeas, cilantro, olives, shallot, and feta (if desired). Drizzle with hummus dressing and serve with homemade pita chips on the side.